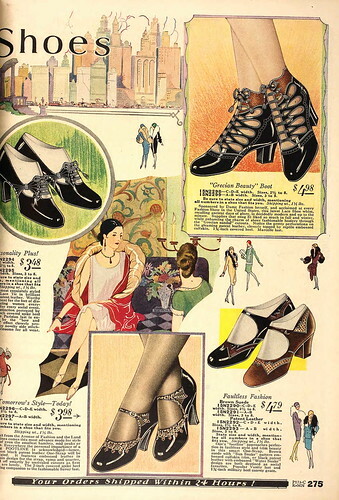 If you would bear with me just a bit longer, I am not quite ready to let the 1920s go . . .
One of the problems with trying out a new style is that so many of my accessories are not quite right. 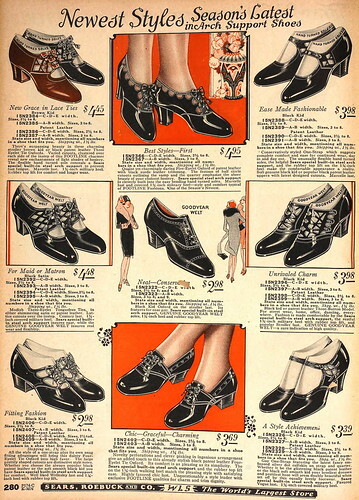 Unfortunately, I do not have much in the way of 20s-style shoes - let along something that will work with a gray dress. Luckily, I remembered my silver heels. They were purchased to complement this dress along with this silver snood a few years ago. I was never very happy with the look, but these silver slippers sure have come in handy. 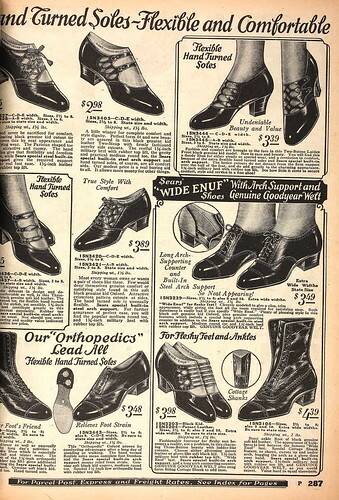 I expected to see more t-straps in a 1928 catalog. 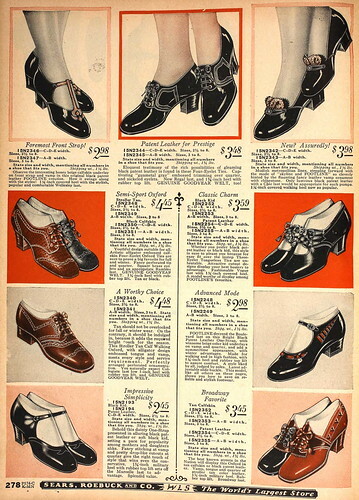 What is clear is that the mary jane was extremely popular. And look at all those cut-outs! The detail work is sensational. 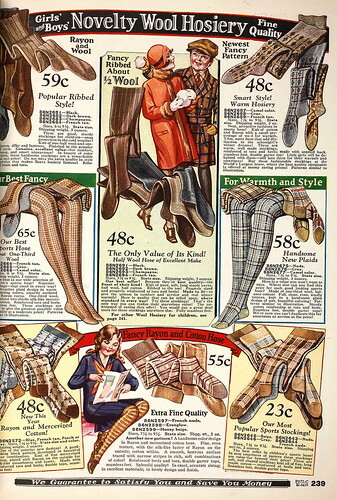 Who says novelty hosiery is a new thing? 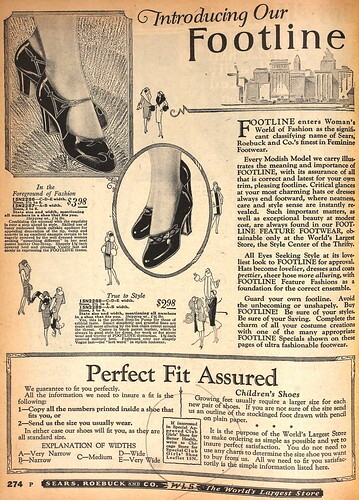 Those flapper girls really knew all about style! I know just what you mean about taking a while to fine tune a new look (or even just sport one for a single day). Earlier this week I wore a vintage dress I'd bought several months ago for the first time. When I bought it the pictures made it seem very 40s (I can't recall off hand if the seller had it listed as being 40s or 50s), and I planned to wear it as such. Well, low and behold, I try it on the other day and am instantly struck by how much of a 30s feel it had. This might not be a biggie for many people, but I don't usually wear 30s styles (they rarely work on me), so I was suddenly scrabbling (because I really did want to finally wear that dress) to put together a 30s-esque look (putting aside the fact my hair has already been styled earlier in the day into a wholly 40s/50s look with faux bangs). In the end, I was actually quite pleased with the look, which even my husband agreed had a 30s feel to it. Usually though, it takes more than a few busy minutes to make a new style (or era) work for the first time. Those shoes are great, love Mary Janes. 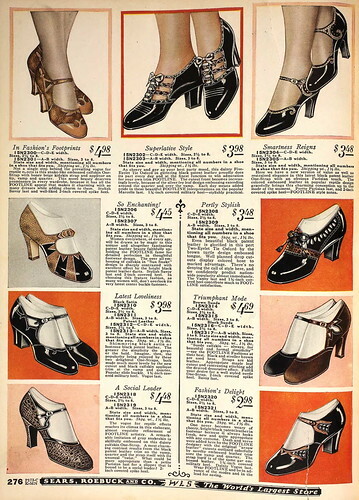 And the cutwork on the shoes is quite beautiful. Oh how I wish I could find some of these to purchase. I love them and could actually use them!!! !